It is drawing a long bow to compare restricted class horse The Candy Man with the legendary Gunsynd but there was a touch of the Goondiwindi Grey in his Sunshine Coast win. Gunsynd is rated among Australia's greatest horses, winning 29 races, and he is the only horse to win all four of the nation's premier miles and a Cox Plate. 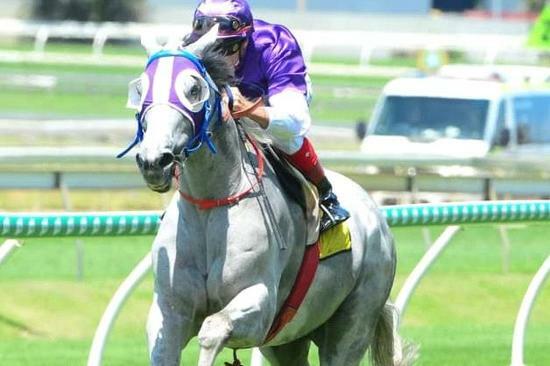 He was part-owned by the late George Pippos who left his colours to his brother Lucky Pippos who uses them to race The Candy Man who is also grey. The Candy Man ($1.50 fav) was expected to win an 1800m-race easily but he missed the start by 10 to 12 lengths when he refused to jump with his rivals. Under the urgings of Damian Browne, The Candy Man chased the field before catching up and hitting the lead at the 100m and going on to win comfortably. The Candy Man has already had plenty of media exposure because he broke his jaw in seven places in a stable accident. The gelding spent nearly 10 hours on the operating table at the Gatton horse hospital. "We thought we had a stakes horse before his accident," Baldwin said. "I hope he can win a good race, but we will have to work on his barrier manners. "The stewards have ordered him back to practise, but we'll give him a little break first. He might be getting a bit cunning."